Gamma creates simplified communications and software services for business. With a broad range of voice, mobile and data services, we lead on network strength, products that are both easy to use and provision, and quality through automation. Gamma are one of the largest network carriers of fixed-line voice minutes in the UK, providing a comprehensive range of next generation voice, data and mobile services to businesses, the Public Sector and not-for profit organisations, including the latest IP telephony phone systems, high speed internet and data connection packages, mobile services and unified communications solutions. As of June 2016, Gamma has 717 staff based across the UK and in Budapest. JabbaTalk is proud to announce its Partnership status with UAB Ruptela. 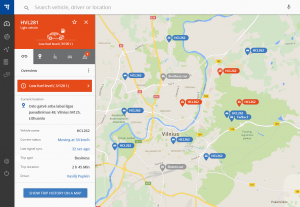 Ruptela is a Lithuanian telecommunications company that develops transport management solutions. The company produces GPS/Glonass tracking and monitoring software and hardware and provides the relevant solutions. The company’s products are designed for real-time monitoring of vehicles and optimisation of vehicle operations. Established in 2007, at present the company has representative offices in 5 countries, whereas its partners and clients are located in 116 countries of the world. Ruptela UAB has representative offices in Russia, Ukraine, Belarus, and Poland. The headquarters of the company are in Vilnius, the their hardware production facility is based in Kaunas. “Ruptela” was recognized as the 7th fastest growing technology company in Central Europe by “Deloitte” in„Technology Fast 50“ rating. Turnover growth of 1211% guaranteed 7th position for the company on the rating. Last year company was in 5th place with the growth of 1282%. “Ruptela” is the only Lithuanian company that managed to be among Top 10 fastest growing companies two years in a row. International audit and business consulting company “Deloitte” published fifty fastest growing companies list –„Technology Fast 50“ rating for the 15th time. This year average participants growth was 698%. Companies were evaluated by last five years turnover growth. We are proud to have worked very closely with Ruptela since 2008 when they were made up of only 12 employees, last month we visited them in Lithuania and we were told the latest head-count was 129 and counting! Our relationship is both solid and strong and our future is very bright, together we have helped develop solutions that are now used by tens of thousands of customers world-wide. We believe together and with the combined knowledge of these like minded business’s coupled with their expert staff we can create a system that is not only second to none, but is available to everyone at very realistic prices. Other members of the Ruptela Partner Network are currently operating in Singapore, Mexico, Germany, Norway, Moldova, Romania, Spain, UAE, Saudi Arabia, Sweden, Finland, Netherlands, Denmark, Holland, Namibia, Kenya, Tanzania, Uganda, South Sudan, Rwanda, Congo, Tunisia, Senegal, Côte d’Ivoire, France, & Jordan. 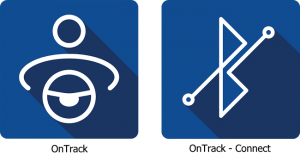 In Q1 2017 we will be releasing TrustTrack 2.0, our new Fleet Monitoring & Control System, together with a new Route & Optimisation System also complimented by our new updated smart phone APP. TrustTrack, offering our customers, small or large, a complete solution for their fleet of vehicles. Fast and smooth – no more waiting for pages, objects and reports to load. Intuitive – users will see only the needed information. Smart overviews makes it easy to use the system and acquire key information. Good looking – rich data is presented in a pleasant info-graphic style. Design that stands out from the crowd and increases user satisfaction. TrustTrack 2.0 – is a brand new look and feel to our already popular system offering a real time transport monitoring and control system. Fleet monitoring and control reduces vehicles operating costs, fuel consumption and saves on employees time. Smart search – innovative tool to navigate system and gain the highest value. 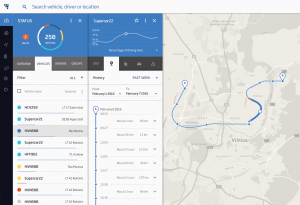 TrustTrack 2.0 – allows you to monitor a variety of vehicles parameters such as location, speed, route history and changes, fuel level, fuel consumption and more advanced parameters such as CANbus data, driver’s behaviour or tachograph data, & much much more. Mobile friendly – adaptive and responsive design that fits to any screen size. Comfortable to use on all mobile devices. This release is designed for basic tracking, but later in the year we will introduce full version with all advanced functionality. Tasks – this powerful tool can also help manage your service, delivery and collection jobs. It is based on innovative optimisation engine and algorithm that gives you a full control over your daily order, cargo and route management tasks. 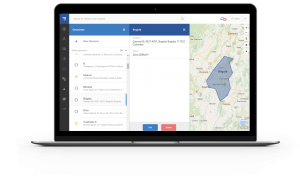 Plan you delivery/route all in one place. This allows the operator to create a certain task for the driver and send it to them using the app. The operator can also monitor the task status from their status screen. API Integration – We can now offer API and web services that will allow TrustTrack to integrate with other systems and to make processes more effective and create new solutions to help your business operate more efficiently. Please register your interest using the form opposite and we will be in touch.